The last week has been hectic, both for ammo and I getting ourselves down to Melbourne for a beery weekend and back to the real world, and also online, because the blog’s traffic has gone slightly ballistic. While I won’t go into the laughably small numbers, suffice to say we’ve gotten a week’s worth of traffic through on Sunday and more still through on Monday. In short, thanks dear readers. No doubt part of that is due to McLaren Vale Beer kindly linking to our little corner of cyberspace from their website but I’ve also seen Google searches for “duckstein porter gabs”, “grand ridge the dark side of juniper” and “selvmordstokt”, which as you can imagine are not normal keywords. Unfortunately, Google has taken visitors to our hitlists (ammo, Liam) which run along the lines of “Hey, I want this beer, it sounds delicious.” Useless, in other words. 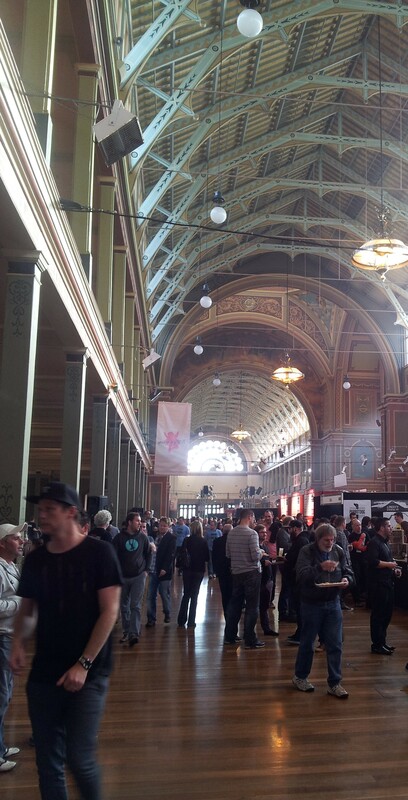 Now that we’ve been to GABS and survived, we can tell you which beers lived up to the hype. 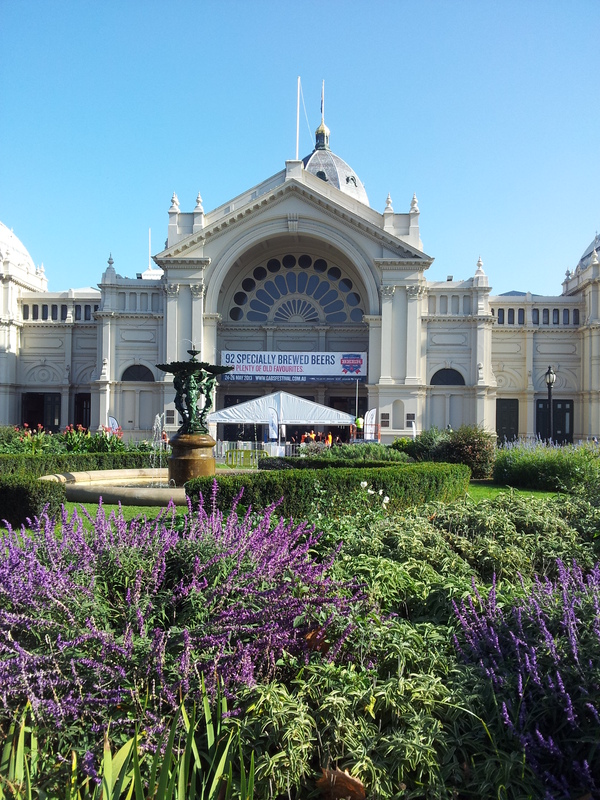 The Great Australasian Beer Spectapular was held this year in the Royal Exhibition Hall in Carlton from 24 to 26 May. The building itself is amazingly beautiful, very much in the nineteenth century Victorian style. It’s also perfect for a beer festival: the enormous hall is perfect for laying out long tables of beer swillers, accommodating the massive lines in front of the bars, the bigger brewers standalone stalls and a decent live band to give the high ceilings some atmosphere. All up, GABS managed eighty-nine unique beers (Temple, Old Salt and The Factory were scratched for various reasons). ammo and I worked our way through forty-four beers. While our experience is by no means exhaustive, it was exhausting. 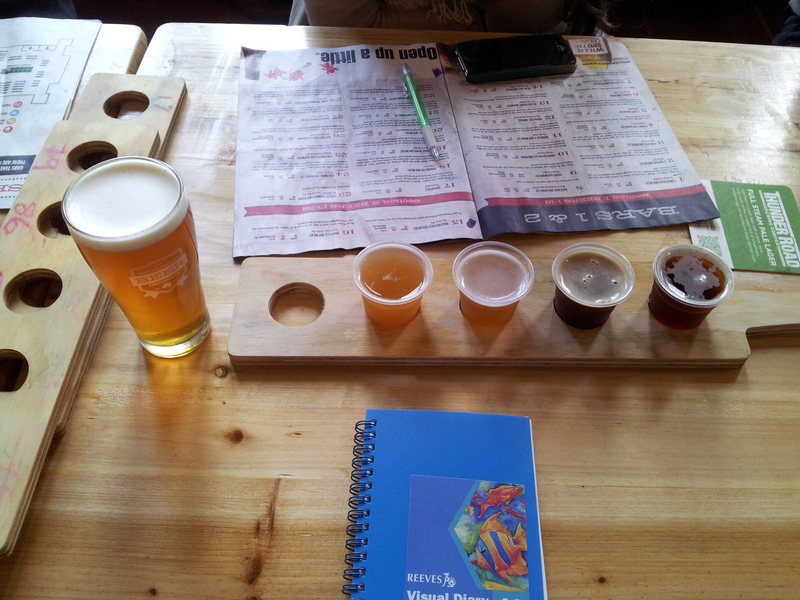 Trying to decipher the subtle differences between your sixth and seventh IPA for the day is a tricky task indeed. We could only bring ourselves to do two of the five sessions, partly because of cost, partly lack of energy and partly because we’re crowd-hating introverts. For me, this was an easy choice because it was the only one that really knocked my socks off: Feral Brewing’s Barrique O Karma (31). I don’t know how they consistently come up with high quality beers but they’ve done it again. Barrique starts out like an ordinary IPA and then just after you swallow the beer, you get an almighty rush of woodiness (heh…). It’s like chewing on a malty paddle pop stick with overwhelming awesomeness. ammo stalks the poor guy from Hopdog Beerworks at just about every festival but I’m becoming a big fan too. Hopdog’s An American Werewolf In Belgium (40) takes all the best parts of a Belgian Tripel and pumps it up with some tropical, honey, floral American hops to create a beast of a beer (yes, I should write copy). Neither ammo nor I were much impressed by the Two Birds Brewing offering at the Canberra Small Brewer’s Festival. You can imagine our surprise when they popped up in Critics Choice Top 100. Two Birds Brewing Taco (86) may have changed that for us. With a zesty, pineapple aroma, suggestions of coriander and lime and fresh, tasty hops this is the kind of beer I want to make. I’m now considering tracking down some Sunset Ale for a review. Pinchgut Brewing Bjørn’s Red Ø1 (67) picked up the nickname DIRS (“derrrs”), short for Danish Imperial Red Stout, over the weekend. This beer tantalised all the senses with butter: it smelled, tasted and felt like sweet, smooth buttery goodness. While I probably wouldn’t want more than one drink of this, it is an incredibly well put together beer. These are festival beers, which tend to push the boundaries even further than your typical craft beer. At 1.5% when the festival average was around 7%, Young Henry Divine Manchu (91) is a seriously low ABV beer. It’s built on a symbiotic yeast/bacteria culture, which sounds like what happens when your homebrew gets infected, and wasn’t on either of our radars but after a seedy start to Saturday, this refreshing, apple juice-like, sour concoction was just what the doctor ordered. As much as it pains me to say it, White Rabbit Teddywitter (89) tasted like the water you cook your rice in and not much else. Bright Brewery Supermucilaginisticexpialidocious (20) was on my hitlist for its shopping list-like tasting notes. What you actually take away from it is the incredibly thick body of the beer. It is literally syrup and a ton of flavours but too much to figure out what’s happening. Overriding it all is the booziness, which pervaded many GABS beers, and I was sick of it an hour into Friday. Mountain Goat Andy’s Reserve Amber Ale (60) was also on my hitlist in the vain hope that it would improve on the lacklustre Hightail Ale. Surprisingly, Andy’s Reserve had even less lustre. It was lighter in colour than a normal amber ale, bready with a hop finish, lingering but all around uninspiring. “One dimensional” about sums it up. Schnitzel Republic is not a brewer but a supplier of schnitzel-based sandwiches at the festival. Overly salty and slow, these guys were struggling to keep pace in the first session and not really worth $10 for what we got. The chicken parma at the Gertrude Hotel we had on Saturday was a much better decision. I could go on but I have to stop before you do. ammo will take over next week to talk about suicide, balsamic vinegar, beetroot and Christmas beer. 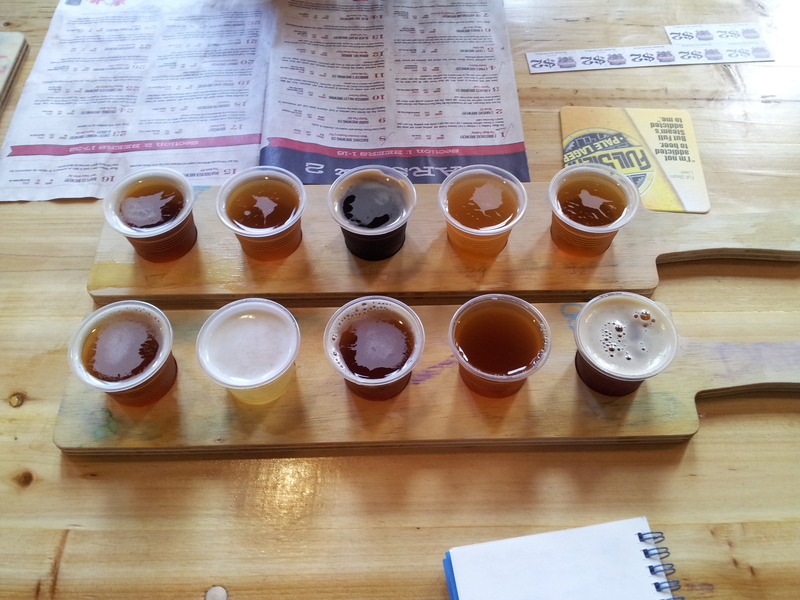 There’s a full listing of our tasting on the Drunken Speculation Untappd account where we checked-in each of the sixty-odd beers we had over the weekend. Enjoyed the read, looking forward to part 2. I volunteered at Sessions 3 and 5, and partook of sessions 2 and 4 (flew down from Sydney to participate). I enjoyed Feral’s B’o’Karma and was pour pots and pots of it for the punters – I also really enjoyed Garage Project’s ‘Death From Above’ did you get a chance to try it ? Cheers and good on you for volunteering. I did have a go at Death from Above. Unfortunately, I’d built it up a bit in my head and was expecting a spring roll with mango chutney in a beer. Bit disappointed to only get a spicy pale ale but in retrospect it wasn’t too bad. Just goes to show that you shouldn’t put too much faith in brewer’s tasting notes.